It’s been a fantastic year for Mixed Martial Arts. Once deemed a sport that had seen it’s most popular days, this year its turned a corner, and has seemingly been embraced by the mainstream. No doubt thanks to a couple of huge stars (more on them later), MMA and the UFC is now seen by more eyes than ever before. – Conor McGregor, November 2014. In a year of ups, downs and craziness in MMA, there has been but one constant. Conor McGregor made a name for himself last year as a brash and cocky up and comer who predicted big things for himself. In a game where people so often write cheques they can’t cash, McGregor took the entire sport to the bank. Beating Dennis Siver in January at the TD Garden in Boston, McGregor scaled the Octagon and threw himself at UFC Featherweight champion Jose Aldo. The scene set the trend for an entire 12 months, and the biggest fight in UFC history. An unparalleled world tour followed, with the champion and challenger holding press conferences in different cities and countries alike. By the end, McGregor had the champion frustrated, with Aldo looking increasingly worn by the Irishman’s antics. With a couple of weeks to go, Aldo pulled out of the fight with a broken rib. In his stead, Chad Mendes stepped up and fought McGregor for the Interim Featherweight belt on short notice. The event (UFC 189) was ground breaking. Live acts to sing the fighters in, new uniforms and graphics made the night feel special. The Irish flew into Vegas in their droves to see their man fight, and win. The fight with Aldo became bigger, and the two were rescheduled for UFC 194 in December, but not before McGregor could take his antics up another notch. Immediately following his besting Mendes, McGregor was made The Ultimate Fighter coach against Urijah Faber, and single-handedly drew attention to the incoming split between teammates Faber and Bantamweight champion TJ Dillashaw, a fight that if it happens, will now be massive. As if his year couldn’t have been any crazier, McGregor went out and starched Jose Aldo, an opponent who had been unbeaten for a decade in just 13 seconds. The fastest title fight in UFC history. As undisputed Featherweight champion, it’s now hard to argue that McGregor is the biggest star in the sport. UFC 194 and 189 were two of the biggest events in the sports history, and although PPV numbers are yet to be confirmed, 194 looks as if it could be the biggest since monster event UFC 100. One week later, his Go Big proclamations took on a new light at UFC on FOX 17. Three of the top five victors in Nate Diaz, Charles Oliveira and UFC Lightweight champion Rafael Dos Anjos called him out, attempting to get big financial fights. 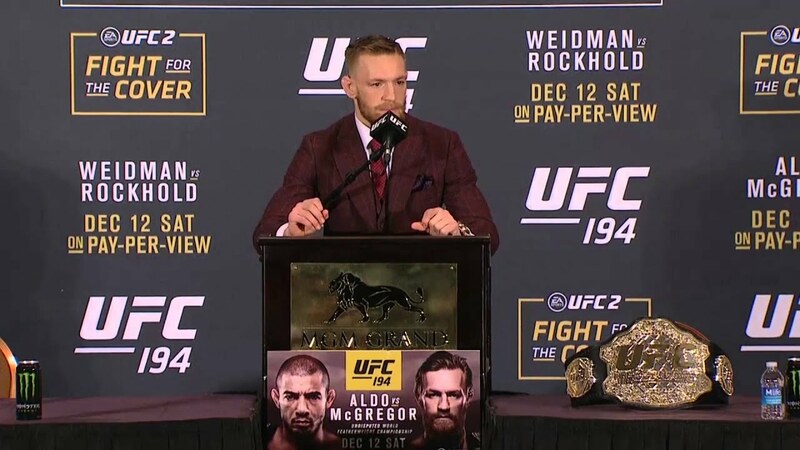 For McGregor, 2016 will be huge. He has so many different options, and all of them provide him with big money fights. His eyes set on gaining a second title at lightweight, it remains to be seen whether he can beat bigger stronger fighters. It must be said however, with the ‘Notorious one’, stranger things have happened. Oscar is a journalist from London, currently residing in Seattle. He has had work published by NBC News, The Central Circuit and The Voyager.